Planting Fields Arboretum Wedding Photos LI. Nestled just outside the quaint Long Island village of Oyster Bay, you will find one of the most amazing places anywhere to take awesome wedding pictures. The Planting Fields Arboretum has it all. Sprawling great lawns surround it’s resident mansion, Coe Hall. 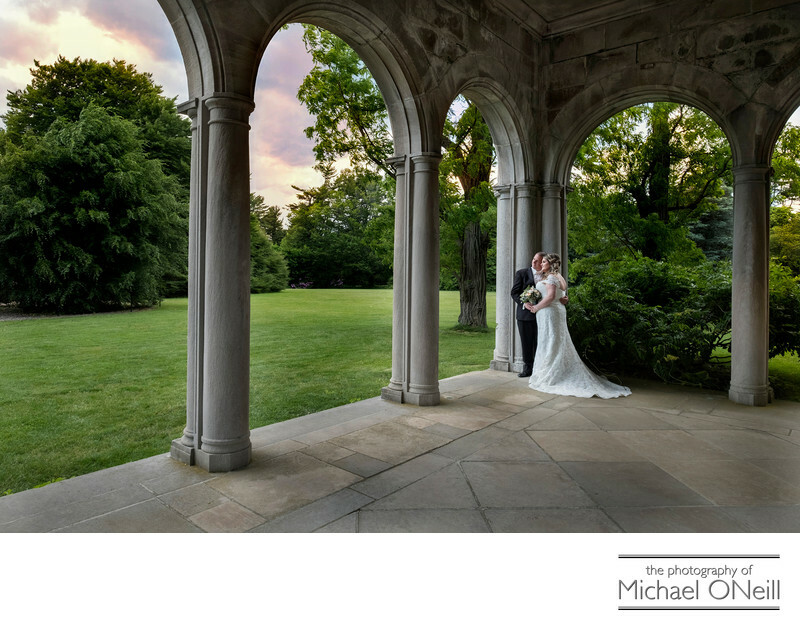 The mansion offers some of the most beautiful backdrops available…including it’s grand portico which is pictured here. Also on site are rose gardens, reflecting pools, a cute little pink doll house, The Camellia House greenhouse and hundreds of beautiful specimen trees from around the world. No matter what the season Planting Fields offers stunning backgrounds for your wedding pictures. Cherry blossoms in the spring. Perennial flower gardens in the summer. Amazing fall foliage in autumn. This is the perfect spot to bring your wedding party and your families for formal portraits and candid, casual pictures as well. I have been creating awesome wedding photographs at Planting Fields for more than 30 years. I am familiar with every inch of the park and know just how to get the greatest pictures on any given day…any time of the year…regardless of the weather conditions…at any time of the day. You will pay a small site use fee to bring your bridal party to this wonderful venue but it is more than worth the price to experience one of the most beautiful wedding backgrounds anywhere.